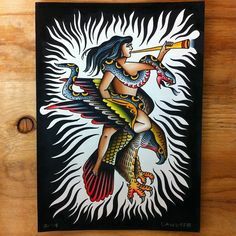 Lady riding eagle and snake.. Dietzel? I'm trying to track down some flash of an eagle with a lady riding it fighting a snake. I think it was an Armund Dietzel piece, anyone know?